Vega's new 12 O'Clock Sport Boot has an articulated in-step which provides support and flexibility for sport bike riders. With the sleek street racing look and black and white design you'll never want to take them off. The combo hook/loop zip closure combined with the supportive molded heel cup, reinforced leather ankle, padded, contour molded interior and padded foot bed will keep you riding in comfort for hours. The zipper has a gusset for easy on/off and the Velcro band offers a tighter fit. 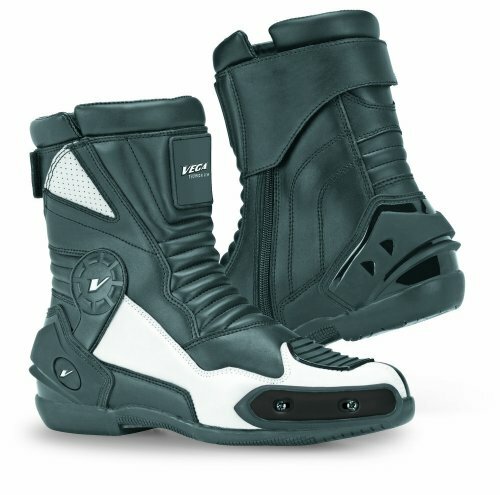 With a sturdy rubber sole and replaceable toe sliders this will become a favorite boot for sport bike riders. With sizes eight through thirteen available everyone can find the perfect fit. All of Vega's technical gear is backed by 1 year manufacturer defect warranty. Vega Helmets was established in 1994 with the goal of offering a quality product with the most wanted features at a reasonable price. The quality of everything that goes into these boots are controlled by Vega. A variety of different apparel to fit every need, and accessories for every helmet, including mirrored shields, ear pads and snow accessories are offered by Vega. If you have any questions about this product by Vega Technical Gear, contact us by completing and submitting the form below. If you are looking for a specif part number, please include it with your message.